3A: CO2 - It's a Gas! EarthLabs > Climate and the Carbon Cycle: Unit Overview > Lab 3: Carbon in the Atmosphere > 3A: CO2 - It's a Gas! Part A: CO2- It's a Gas! View the image below. On which planet would you like to live? With with a partner or group, compare the atmospheres of Mars, Earth, and Venus in the image above and then use the following questions to guide your discussion. On which planet would it be possible for you to live? Why? Which planet would have a greater diversity of life (biodiversity)? Why? 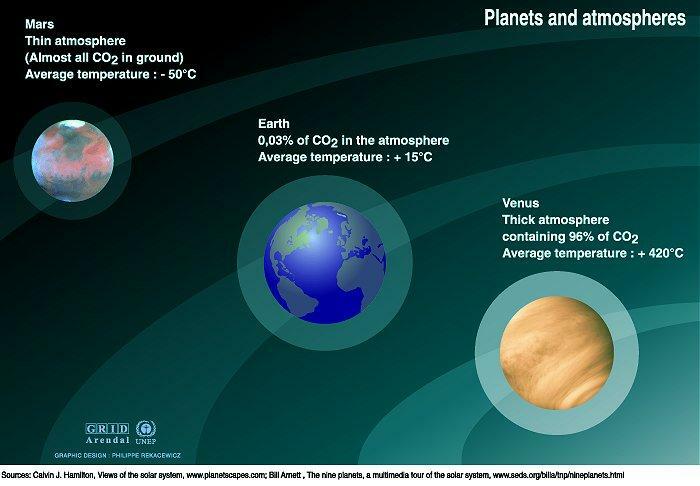 What relationship, if any, do you see between the amounts of carbon dioxide and the temperature in these three atmospheres? 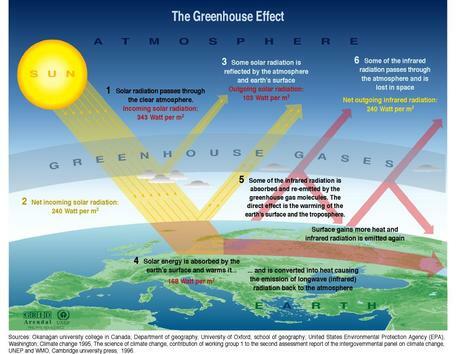 You have probably heard about the "greenhouse effect" in previous science classes or in the media. Based on your current understanding of the greenhouse effect, which planet do you think has the strongest greenhouse effect? Which has the weakest? Why? Scientists now know the comfortable climate we enjoy today on Earth is due to a natural greenhouse effect natural phenomenon that warms the temperature of Earth's surface and lower atmosphere because greenhouse gases absorb and emit infrared radiation that would otherwise escape to outer space. Some of this emitted infrared is returned to Earth's surface regulated by greenhouse gases atmospheric gases that warm the temperature of Earth's lower atmosphere by absorbing and emitting infrared radiation that would otherwise escape to outer space; includes carbon dioxide, methane, water vapor, ozone, nitrous oxide and CFCs.. Carbon dioxide (CO2) and methane (CH4) are two powerful greenhouse gases produced by the carbon cycle. solar shortwave radiationenergy radiated from the Sun mainly in the form of visible light, with small amounts of ultraviolet and infrared radiation; solar radiation is usually referred to as shortwave radiation while infrared radiation is referred to as longwave radiation. infrared longwave radiation (IR) lies between the visible and microwave portions of the electromagnetic spectrum; "near infrared" light is closest in wavelength to visible light and "far infrared" is closer to the microwave region of the electromagnetic spectrum; far infrared waves are thermal which we feel as heat. Describe how the greenhouse gases CO2 and H2O contribute to Earth's greenhouse effect. What if no infrared radiation was re-emitted back to Earth's surface by greenhouse gases? Do you think Earth's climate would be colder, warmer or the same? Explain why you think so. As you can see in the pie graph pictured on the right, the lower atmosphere is made mostly of nitrogen(N2) and oxygen(O2) gas molecules. While both nitrogen and oxygen are important in supporting life on Earth, they are not greenhouse gases. Greenhouse gases such as carbon dioxide and water vapor comprise a very small part of the lower atmosphere and are found only in trace amounts. Consider the table below and then answer the Checking In questions that follow. Average Residence Times describes the approximate amount of time that different types of atmospheric gases spend in the atmosphere before chemically decaying or moving to another reservoir. A greenhouse gas with a long residence time has greater potential to build up to higher concentrations. This would in turn lead to more infrared being absorbed and a stronger greenhouse effect. Variability over Time and Spatial Scales describes how the concentration of an atmospheric gas varies over time and space. For example, concentrations of nitrogen and oxygen remain fairly constant around the globe. In contrast, the concentration of CO2 varies over both time and space. For example, in the northern hemisphere (a large hemispheric spatial scale), the concentration of CO2 varies from season to season. H2O vapor in the atmosphere is highly variable because it is part of the water cycle. Some days and regions are dry whereas others have quite a bit of rain. Which greenhouse gas resides in the atmosphere for longer periods of time? Choose all that apply. 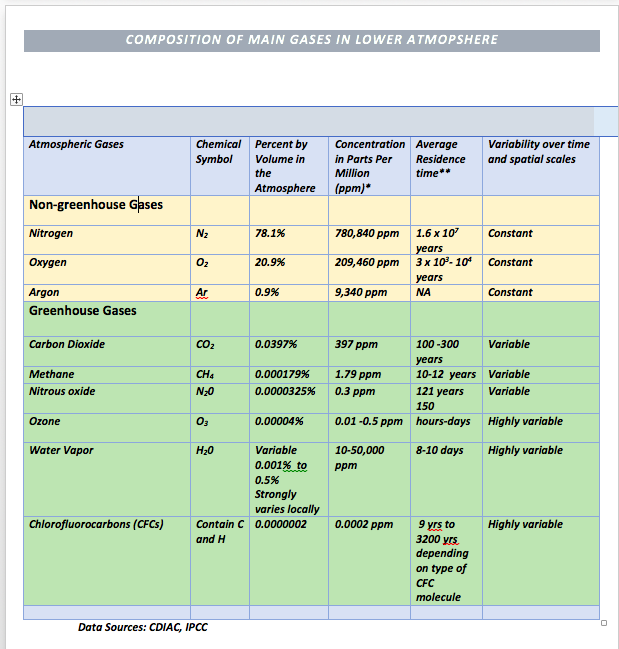 Which greenhouse gases in the table are carbon compounds? Choose all that apply. Which greenhouse gas is most abundant in the atmosphere? Which greenhouse gas has the greatest potential to build up larger concentrations over time? Why do some gases in the atmosphere absorb infrared photons very small packets of energy associated with different wavelengths of electromagnetic radiation; photons associated with specific wavelengths and frequencies of electromagnetic radiation can be absorbed by molecules with matching frequencies. whereas others do not? Nitrogen (N2) and oxygen (O2) molecules do not absorb infrared photons even though they make up more than 90% of Earth's atmosphere. Conversely, CO2molecules comprise only 0.0397% of the atmosphere yet are strong absorbers of infrared photons. Why? It turns out that structure of a greenhouse gas molecule determines its ability to absorb and re-emit infrared photons. The physics of absorbing and re-emiting infrared photons creates the greenhouse effect. In the next two videos, you will investigate the molecular structure of greenhouse gas molecules and the simple physics of absorbing and re-emiting infrared photons. Then, watch geoscientist Scott Denning using his own personal dancing style to illustrate how greenhouse gas molecules absorb infrared radiation and make the Earth warmer. NOTE: You can pause and rerun sections of the videos as needed. How the molecular structure of a greenhouse gas is related to its ability to absorb infrared radiation. Why N2and O2 cannot absorb infrared photons. When a greenhouse gas molecule absorbs an infrared photon, what happens next? When you finish, share your notes from the videos with your partner or group. Answer the Checking In and Stop and Think questions below. Which of the following statements are true about gas molecules in the atmosphere? Choose all that apply. Infrared radiation is often referred to as thermal (heat) radiation. When GHG molecules re-emit infrared photons, where can these re-emitted photons go? Choose all that apply. If we added more greenhouse gas molecules to the atmosphere, what might we expect to happen? Choose all that apply. More infrared photons would be re-emitted back to Earth's surface. Less infrared photons would be absorbed by greenhouse gases. More infrared photons would be delayed from leaving the atmosphere. The atmosphere would eventually become cooler. The atmosphere would eventually become warmer. 1: Explain why carbon dioxide, methane and water molecules are greenhouse gases whereas nitrogen and oxygen are not. Try it in words or even your own dance! Ready to extend your knowledge and try your hand at modeling? Use the following interactive to set up some experiments. This animation is not included in the EarthLabs iPad app. To view this animation please use a flash-enabled device. This content is available in flash format only. Please consult our instructions for enabling Flash in your web browser. Source: Climate model interactive developed by Randy Russell, UCAR. Used with permission. First, explore the interactive using the preset CO2 emissions rate and time step size. Click Start Over to change the variables and investigate the relationship between CO2 and temperature. In the year 2000, 6 Gigatons of CO2 was released into the atmosphere. Discover what might happen to temperature if we increase our rate of emissions. Decide how much CO2 will be released into the atmosphere each year and set the CO2 emissions rate. Next, adjust the Time step size depending on how far you want the model to move into the future with each click. When you have chosen your settings, click the Step Forward button to see how temperature and CO2 change. Click Step Forward until you've filled the graph to the year 2100. When you have finished exploring answer the Checking In questions below. What does the graph mean? Blue triangles (and blue y-axis scale) indicate the emissions of CO2 in the atmosphere each year. This is measured in Gigtatons of CO2 (GtC) per year. In the year 2000, we released 6 Gigatons of CO2 into the atmosphere. Black dots (and black y-axis scale) show how much carbon dioxide has built up in the atmosphere over time. This is measured in parts per million by volume (ppmv). The actual amount was around 368 ppmv in the year 2000. What happens to the average global temperature as you increase the concentration of CO2 in the atmosphere? As you increase the concentration of CO2 in the atmosphere the average global temperature also increases. How do the slope of the temperature and CO2 concentration lines change as you increase the emission rates? As you increase the emission rates of CO2 the slope of the other lines both increase. This is because you are compounding the amount of CO2 in the atmosphere. Lab 2: Carbon on the Move!